A memorial garden sculpture is a beautiful way to honor and pay tribute to a loved one. When we lose someone we love we seek ways to remain close to the people we have lost. Although this is difficult, the grieving family and friends seek ways to celebrate their loved one's life and ensure that they are not forgotten. A garden sculpture dedicated to the person will be there for years to come. If you move house it can come with you. 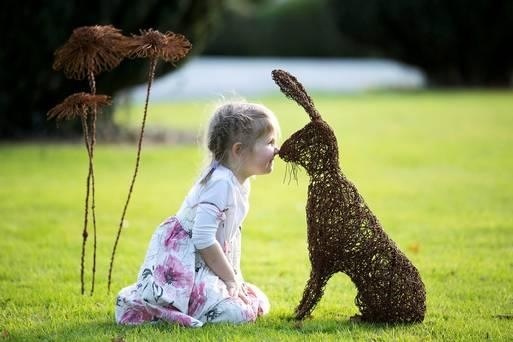 The sculpture can be placed in your garden or in a public place they loved e.g. a place they walked, a public park etc. You will be able to visit it and contemplate on happy memories of when your lost loved one was still alive. Creating memorials to lost loved ones can help cope with bereavement and the process of going through the grieving process. For those left behind this is an extremely heart-breaking time, and I hope that the pieces I create can offer some comfort to a family member or friend looking for a unique way to remember and pay tribute to their lost loved one in the years to come. Choosing a piece for a loved can be a poignant task. I am a sensitive person and I will take time to make sure you are content with the options available and will endeavor to create a bespoke piece for you that will be the perfect keepsake for your loved one. Foxes are often commissioned for the loss of a young boy, the little foxes are playful and clever and they have that air of mischief while being incredibly cute. They can live in any space, providing that reminder that a special person is remembered and loved. The hare is adored by children, it is energetic, good natured-ness, is so sweet and the springing hare stands for happiness and in some cultures may signify rebirth or resurrection. They can be made standing, sitting or in a playful boxing pose. Fairies have been requested to commemorate a girl or woman who is magical and believed that anything is possible. They are so pretty and captivating and add a wonderful air of enchantment to any space or garden. There are so many possible options to choose from and I will help you decide on the perfect one for you. If you would like to talk to me about possibilities without any obligation email me and I will get back to you.